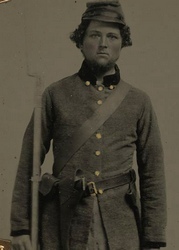 Civil war uniforms served the dual purposes of distinguishing friend from enemy on a smoke filled battlefield, particularly in hand to hand combat, and encouraged unit cohesion. As the war lingered and became more intense, maintaining morale was critical. The uniform became a soldier's personal flag and promoted an esprit de corps with brothers-in-arms. In the early years of the war, uniforms were a badge of patriotism and attracted new recruits to fight for the "cause". In 1861, North and South shared the mutual concern of a single standard for their uniforms. The nation, both Union and Confederacy, competed with their several states to issue a standard uniform. The variety of color and style was staggering. The notion of northern blue and southern gray was to evolve over the war years. 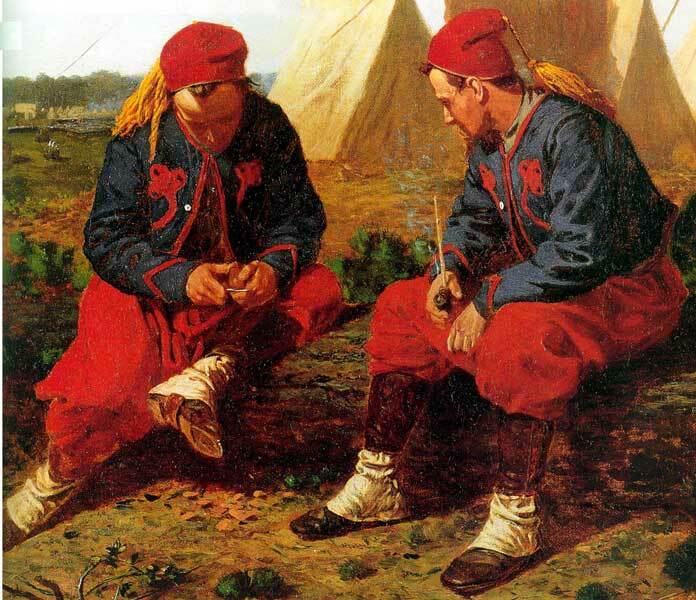 The distinctive Zouave uniform was created 30 years before by the French army in North Africa. It attracted French immigrant recruits in New York where the style was utilized by New York fire company militias. 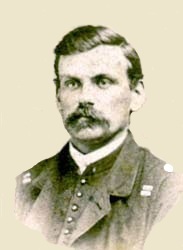 One such company, 11th New York Infantry, was led by Colonel Elmore Ellsworth, the first Union officer to die on May 24, 1861. The contrast with the simplicity of a rebel private was stark. The South also had its moments with the garish Zouave style when adopted by a New Orleans militia known as Wheat's Tigers, and sharply contrasted with the desired standard. In 1861, Louisiana had their militia uniforms manufactured in England which became the south's principal supplier of cloth despite the northern blockade. English textile manufacturers were heavily invested in southern cotton prior to the war. The Confederate states began the war with several impediments that were not shared in the north. Shrinking manpower, diminished financial resources, and a nascent industrial base would ultimately doom their rebellion. However, recent examination of Confederate documents, mainly in the early years, indicate that Confederate shortfalls in resources were less significant when applied to clothing its army. Why has the image of the "ragged rebel" become part of the historical record? Serious researchers have concluded that the Confederate records reveal facts to the contrary. Their conclusion, based on their studies, is that the image helped explain their ultimate defeat--plausible denial. It was not that they were ultimately beaten in battle; not that their strategies failed; not their generals were fallible. 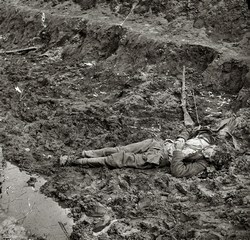 The rationale for the loss was first explained in the southerners oral history of the war as a defeat predicated on limited resources (as described above) and portrayed by the image of "Johnny Reb" in tattered rags. They produced a pictorial history that heavily relied upon the images of the dead Confederate soldier whose uniform always reflected a tattered appearance. "...In books written since the war, it seems to be the thing to represent the Confederate soldier as being in a chronic state of starvation and nakedness. During the last year of the war this was partially true, but previous to that time it was not any more than falls to the lot of all soldiers in an active campaign. Thriftless men would get barefooted and ragged and waste their rations to some extent anywhere, and thriftlessness is found in armies as well as at home. When the men came to houses, the tale of starvation, often told, was the surest way to succeed in foraging... "
Of particular interest to the Confederate army, were the resources required to equip their men. In 1861, the seceding states, or wealthy donors therein, often supplemented the new central government by financing the weapons and uniforms for the men they sent into battle. Nevertheless, the issue of uniforms received the immediate attention of the new southern congress as well as their individual states. The latter used the material available and produced diverse styles and colors. An example was found in the Kentucky State Guard infantry units. The same state unit and strikingly diverse styles and colors. In February, 1861, prior to the first shot of the Civil War, an Act was passed by the Confederate Congress to form a Quartermaster Department. Preparations were underway to equip the troops. Many of the Confederate leaders as well as Jefferson Davis, the President of the Confederate States, were graduates of West Point and were fully aware of the logistics necessary to prepare for war. They readily identified themselves with Cadet gray and the range of uniform design necessary for parade and battle. These leaders were conflicted with the need for standardization and the independent judgments of their several states. Their Constitution celebrated the ideal of the independence of each state and the latter created distinctive patterns, trimmings and colors. However, chain of command was ceded to the Confederate Armies with Jefferson Davis as Commander-in-Chief who then approved decentralized strategies for his armies. Undoubtedly, there were periods of shortage that affected production of uniforms. However, this had no great affect on the southern government to clothe and equip their armies. Some southern regions supplemented their supply with captured goods. 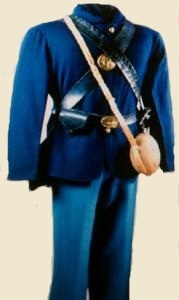 In Texas, an assault on a Union depot uncovered thousands of blue uniforms. There also was a continuing exchange of jackets and shoes with the dead on battle fields.Some army units appointed officers to examine the government issue to determine if the clothing met certain standards. Hardly the act of soldiers desperate for basic cover. Historians have uncovered a trove of Confederate Quartermaster records covering their most difficult years of the war. In 1864, Lee's Army of Northern Virginia fielded 66,000 men of all ranks. During the same period, Georgia produced over 26,000 jackets, 28,000 trousers and 37,000 pairs of shoes. It is safe to assume that the other states still under Confederate control were adding to the supply. Before the first year of war had passed, a Clothing Bureau was established in Richmond, Virginia and divided into a "Shoe Manufactory" and a "Clothing Manufactory". This format was repeated in several other cities with central regional depots. In those states under Union occupation, these sources closed. However, these agencies remained operative in Virginia and Georgia throughout most of the war. The government issue (later G.I.) was intended for the regular army, and did not include volunteers responding to President Davis call for recruits for a Provisional Army. Those new soldiers were given a clothing allowance to outfit themselves. 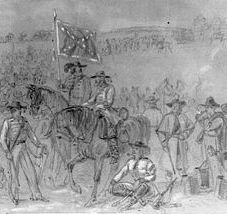 Some of the volunteers continued to serve in their civilian clothes.Ultimately, that system was not practical, and all serving under the Confederate flag were supplied by the central government with exception of those supplied by the states. The system was known as the "commutation period". The actual manufacturing operated a system very much similar to that network which survived in the United States for 200 hundred years. Tailors, located in one location would cut the cloth into the pattern required to make the garment, bundle these separate sections, and sub-contract the pieces along with the buttons, trim and thread to thousands of women to sew them into a finished piece. Raw material and finished cloth does not appear to have been an insurmountable problem. As late as mid 1864, the Richmond depot received in one week 4500 yards of English gray and 3,000 yards of English blue cloth. Wool mills in the south delivered 20,000 yards. Blockade runners were "let" clothing contracts. One such order called for 100,000 uniforms to be procured in Prussia and delivered through England. Inevitably, the variety of sources led to differentials in color and weight. Once landed, delivery was to the region in which the particular Confederate army operated. These armies operated independently in a decentralized system. The goods were delivered to the regional bureau for distribution in a production fashion similar to the Richmond model. 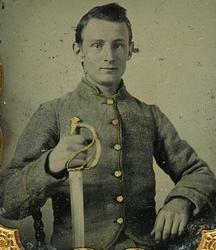 Thus the pattern or cut of a jacket for the Army of Northern Virginia differed from that used by the Army of Tennessee. Variety was subjective from Department to Department. The butternut color, a mix of gray and brown, was used so extensively that Union soldiers referred to the rebels as "Butternuts". Cavalry units operating in the Western Theater displayed differences in style and color. 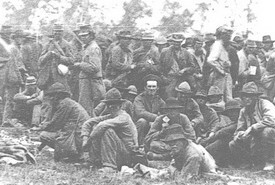 Infantry units serving in proximity in the deep south exhibited significant differences with the seated Florida gentleman wearing coat with tails and the Orleans cadet in standard frock coat (below). Although patterns differed between Confederate armies, they were subject to centralized, general regulations. In 1861, frock coats, knee length, were ordered as the permitted outer wear. 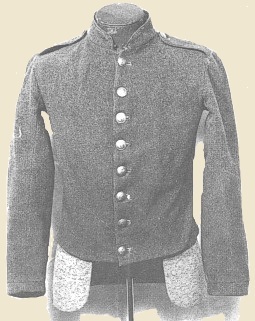 This had replaced an earlier rule that dictated that officers shall wear a tunic of gray cloth known as cadet gray, the skirt to extend half-way between hip and knee, double breasted for all grades. 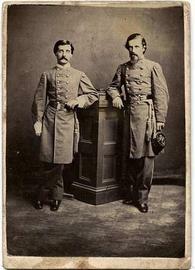 However, in 1862, the jacket, waist length, became the army's fashion statement. Officers seem to have had a propensity for posing for photographs wearing the longer frock coat. When wearing jackets commonly, worn by the common soldier, the officer added colorful piping or cord to exhibit his rank. 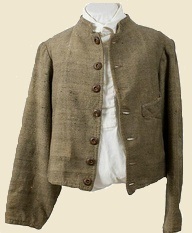 Richmond Depot would produce three types of jackets during the war. Type I had piping about the collar and cuffs and a shoulder strap. 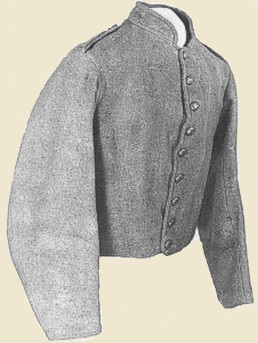 Type II retained the nine buttons, single breasted, but eliminated collar piping and the entire cuff. It has been suggested that the two patterns probably were produced simultaneously, but type II replaced type 1. The change required only omissions of embellishments. We know that type II was worn into 1864 as it was common to these Confederate prisoners captured at battle of Cold Harbor, Virginia. 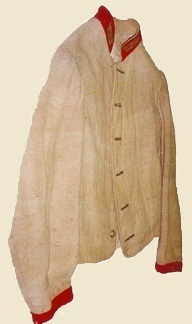 The Type III jacket pattern was a departure from the domestic manufacturing system. Late in the war a Confederate buying agent contracted with Peter Tait, a manufacturer in Limerick, Ireland to produce ready made garments. Tait made deliveries with his own blockade runners. The Tait uniform pattern was adopted by the Richmond Depot. The jacket was more tapered than its predecessors and had 8 buttons. The earlier types had either 8 or 9 buttons. It was not long before the various depots adopted shoulder strap, collar and cuff changes. 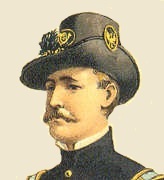 Collar and sleeve insignia signified the officers rank and branch of service, and the color matching kepi (hat) was issued pursuant to regulations of 1861 and 1862. However, cavalry often used an alternate called the stag hat. Red was used to identify artillery and blue for infantry. It was displayed on kepi and collar. Trousers were almost always a shade of blue. The kepi dipped in the front while the forage (fatigue) cap was higher and flatter. Both were adaptations of the French kepi. 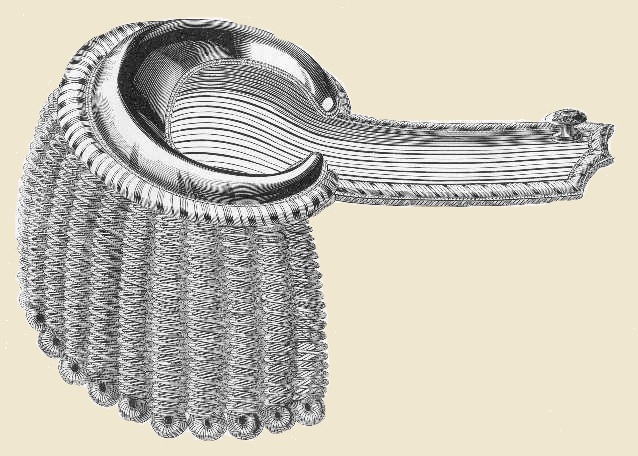 A Union officer in 1858 described the difference thusly: the men removed the "stiffening of thier"(sic) caps "to wear them on fatigue." 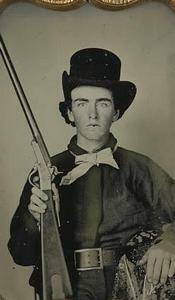 The Confederate cavalry officer favored an antecedent of the cowboy hat. The Marine corps was a relatively small branch of the Confederate armed forces. 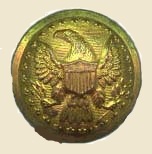 The hat insignia was made of brass and rarely used. Brass was a significant metal for casting cannon---a higher priority. The kepi had a leather brim and adjustable chin strap. 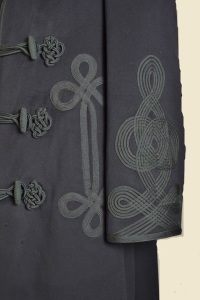 The Naval service developed its own intricate sleeve patterns. One stripe: Lieutenant and three stripes for Captain. The war began with dark blue uniforms but changed with the gray regulation orders. 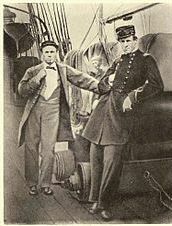 Deck officers on CSS Alabama. Buttons on Confederate uniforms served more than one purpose. Firstly, they were indicia of rank. The more buttons in a row the higher the rank. Seven evenly spaced buttons for the junior officer and eight for the higher ranks. Secondly, the buttons were often identifiers of state of origin or specifically branch of service. The North, as well as the South, encountered problems clothing their armies. Although their resources were greater, they also struggled with cost and production.The latter was constantly exacerbated by deliveries of poor workmanship often caused by unscrupulous contractors seeking to cut corners. Reports from the field revealed that some clothing would hardly last longer than a single march. Nevertheless, their large manufacturing base did produce huge quantities of clothing for the Union. The blue color was the military default position dating to the Revolutionary War. In some few cases, such as the utilization of green for hidden riflemen, it was seen as a tactical advantage for Berdan's sharpshooters who used rubber buttons to avoid glare that would disclose a sniper's position. In the main, the use of color for camouflage would not be considered until the appearance of khaki in the Spanish American War almost a half century in the future. The style of the uniform largely copied British and French military traditions. Military strategies envisioned mass troops battling on wide open fields. Field fortifications were believed to diminish personal initiatives and aggressive charges.The many months defense of Petersburg, late in the war, started Union officers to rethink tactics which would eventually include uniform color. Thus, standardization was built about blue, but with room for variety advanced by otherwise federalized northern states. (See New York Zouaves and Garibaldi Guard above. )The Ogden plate is rich in varietal detail. The coat or jacket was dark blue and the trousers were light blue or described as sky blue and created a pleasant contrast. Cross belts carried the cartridge box, waist belt with oval buckle and cartridge box breast plate. Regulations provided for the issue of the frock coat for all duty officers. The sack coat and jacket (both below) were essentially unauthorized but were often worn in battle. The sack coat was shorter than the frock coat and afforded more freedom of movement. Like most of the outerwear, wool was the chosen material. This was often an impediment in hot whether, but cotton was a southern product and rarely available. War Department Regulation 1442 provided: "All officers shall wear a frock-coat of dark blue cloth, the skirt to extend from two-thirds to three-fourths of the distance from the top of the hip to the bent of the knee; single breasted for Captains and Lieutenants; double-breasted for all other grades". General and staff level officers wore 8 or more buttons and lower officer ranks, from captain on down, 7 buttons. 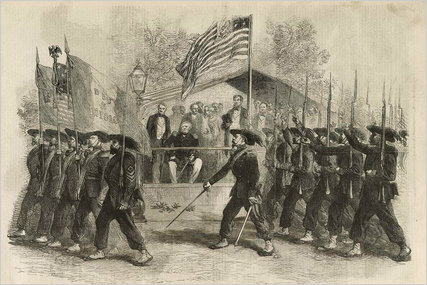 Wounded veterans who returned to service were assigned to a Veterans Reserve Corps pursuant to General Order 1585, May 29,1863. The distinguishing feature of their frock coats were dark blue collars and cuffs trim. 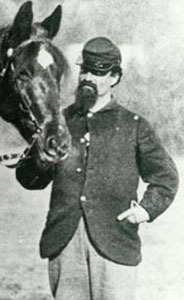 Note the nine buttons and three on cuff denoting an officer as contrasted with the enlisted man's frock coat (2 cuff buttons) and civilian hat. As the war reached its climax, the clothing issued to Reserve Veterans was more in line with the standard jacket issue. Cross belt eagle plate on cartridge belt. Many high ranking officers indulged their fashion tastes with private tailoring that included intricate embroidery on sleeves and body of the frock coat. Velvet collar and cuffs were standard for the frock coat.The private purchase also extended to their swords and scabbards which were often intricately engraved. 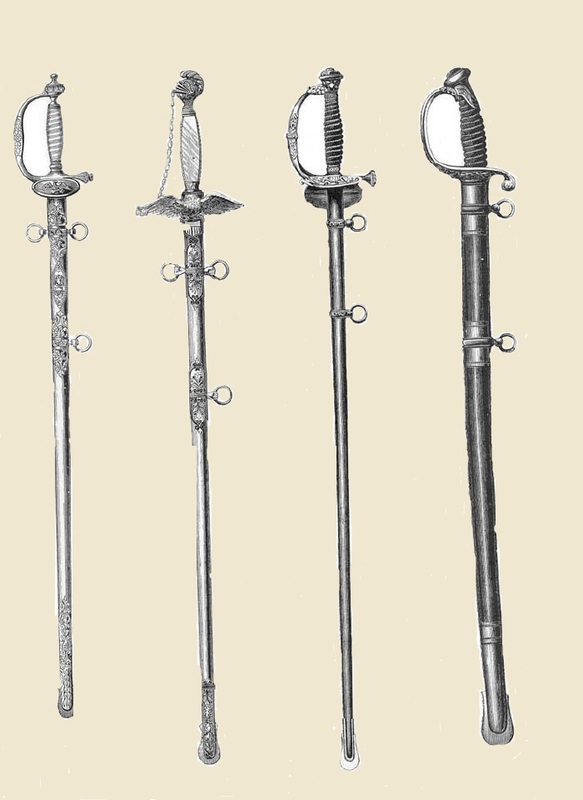 Officers, as a general rule, were required to purchase their own uniforms, sabres and swords, and accoutrements, but some utilized the issued styles. 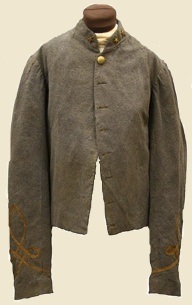 Thus many officers wore the standard sack coat in the field which was a loose fitting, four button garment and styled after the civilian work jacket. 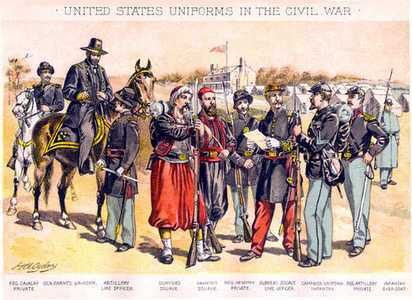 The 1861 Regulations issued by a cost conscious War Department defined most of the uniform basics pictured below.The distinction in rank is evident. The captain wears a single breasted coat, and the colonel is in a double breasted garment. The branch of service is mounted on the front of the hat.The artillery captain displays crossed cannons and the colonel shows his branch of service, the infantry horn. The latter always displayed an "I" on the eagle belt buckle. 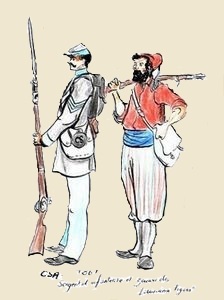 Both wear the light blue trousers, but the colonel displays a blue welting running on the trousers, and the artillery man displays a red stripe on his trousers matching the sash color hanging with his sword. 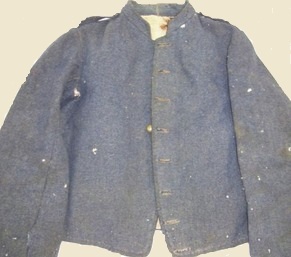 The "round" jacket was favored by mounted soldiers. 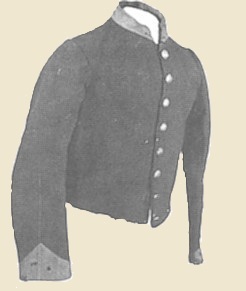 There was little difference in style between the garment worn by the officers and the enlisted men, but trim colors and rank badges emphasized the distinctions. It is evident that function dictated the use of the jacket when a day was spent on a saddle. There were also certain differences between between the mounted man and those on their own legs all day. Trousers were reinforced and hats and boots differed (see below). Regardless of rank, the saber always was present. Some mounted officers wore a double breasted version of the jacket. Ohio and New York troops wore dark blue shell jackets with shoulder straps and belt loops. 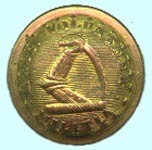 The jackets had 12 small brass buttons on its front and colored tape established branch of service. One New York force (79th) favored the shell jacket that was a copy of the British Highlanders 79th, and replete with kilt for dress uniform. As indicated, the sack coat had universal appeal shared by officers and enlisted personnel. These photographs also display the shoulder strap and the alternate insignia both of which displayed an officer's rank on the sack coat.. 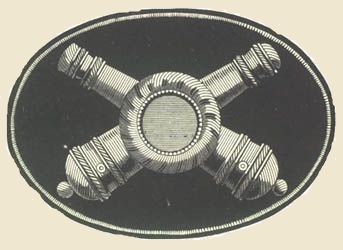 The insignia had the added virtue of less conspicuousness on the battlefield. 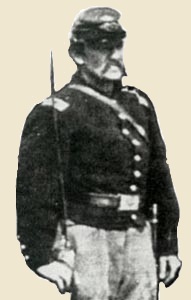 In 1864, General Order 286 permitted the use of the shoulder insignia substituting for the shoulder strap. Hats were proscribed by regulations, but the range, in practice, was infinite. 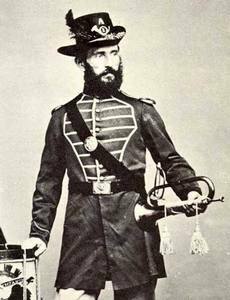 Infantry musicians took the entire uniform to a new level. It was not unusual for enlistees to wear a civilian hat and officers to wear the stiff version of the slouch hat. The official rules for hats proscribed the Jefferson Davis chapeau (aka Hardee hat) and the forage cap, the kepi. Ironically, the Davis name referred to the time when Davis was a member of the U.S. presidential cabinet and promulgated the hat rule. There is a marked similarity with this early version and the later "cowboy" hat. Even the Hardee hat evolved over time. The crown was lowered and creased in the center. The kepi became the workday standard. It was used for fatigue duty and in campaigns. It had a stiff brim with leather peak. It had a colored hat band displaying branch of service. An officer's rank could be displayed on the crown and the company letter designation on the non officer cap. There is an interesting historical fact in this war we are reviewing that deals directly with footwear. 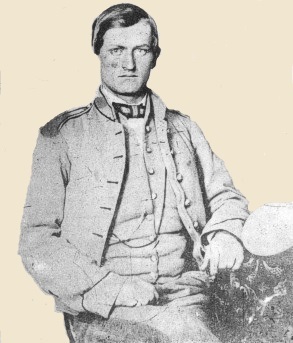 In 1863, Major General Heath led a Confederate division. He learned that a nearby Pennsylvania town had a large supply of foot wear. He ordered a regiment to seize the shoes. With no other plan in mind, on July 1, his forces crossed the town named Gettysburg. 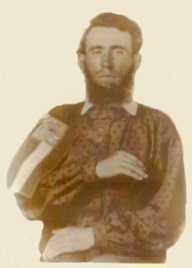 In his words, “As I opened the battle of Gettysburg – stumbled into it, going to Gettysburg to get shoes, not to fight". Both artillery and cavalry were issued calf high leather boots. Some, in the cavalry, wore thigh high boots for added protection for the exposed leg on horse back. There also was the Jefferson Davis boot that was a mainstay of the army. We use, for illustration, two images of Sergeant Boston Corbett as preface to a back story. One of the reasons he is specifically mentioned is because his photographs cover several key points about Union uniforms. The hat he wears was the McDowell cap with a sloping crown, and was quite common. He wore a cross belt, holster and cap box. His right arm displays his sergeant chevrons. He wears the calf covering boots.His left hand grasps his sabre.The additional reason, more significant, is his place in history along side of Captain Doherty. Corbetts (center image) displays the 4 button sack coat and his cap appears to be the typical kepi with cross sabres and his company initial. His Jefferson half boots are covered by his trousers. Each leg carries the vertical yellow cavalry stripe. On the far right, is the uniformed Captain Edward P. Doherty in a short coat. . He wore a single breasted coat with one row of buttons. His left shoulder displayed his rank on a shoulder strap. He also holds the hilt of his sword attached by a hook to his sword belt. He wore the Jeff Davis hat. Both men were emigres who joined the Union Army. The sergeant was born in London, and the captain in Canada. The latter led a force that captured John Wilkes Booth and Sergeant Corbett shot Lincoln's assassin. The Union soldier was relatively self sustaining in the field. Aside from the clothes he wore and his weapon, food, utensils, clean socks, shelter were carried in his knapsack. 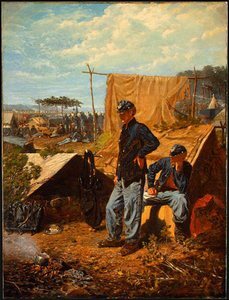 Famed artist and on the field observer, Winslow Homer, caught it all in his "Camp" painting. The knapsack is seen hanging, and almost defies science because of the amount to be stuffed in such a small bag. the "Home Sweet Home" title was also the title of music played by the infantry regimental band. This iconic painting is a fit manner to conclude the discussion of the Union uniform. 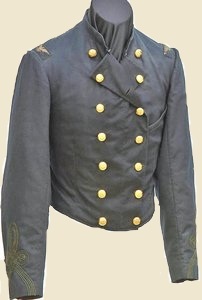 Jensen, Leslie D. Company of Military Historians, A Survey of Confederate Quartermasters Issues Jackets. Varhola, Michael O. NY Times Opinionator, June 15, 2011.